For generations, our tax dollars have served as shared investments in the programs and services that make our state a great place to live, work, and play. Tax dollars enable Montanans to work together to achieve things which we could not do alone - educate our children, build and maintain infrastructure, provide public safety through police and fire protection, keep our air and water clean, and pave the way to a stronger and more inclusive economy. Corporations that operate in Montana (whether they own property, pay staff, or sell products) are required to pay a tax as a percentage of their net income earned in Montana. In turn, corporations benefit greatly from our shared investments. For example, corporations hire workers educated through Montana’s public schools and colleges, utilize infrastructure like roads and water systems, and benefit from Montana’s public safety and legal system. Montana, these shared investments are managed through the state’s “general fund.” Taxes make up the vast majority (96%) of the revenue for the General Fund, and the individual income tax is the single largest source of revenue for the general fund, comprising just over half of the state’s tax revenue (Chart 1.) [i],[ii] In general, taxes paid by corporations are paid through the corporate income tax. However, depending on how the entity is structured, business income may actually be reported through the individual income tax. Specifically, if the business is structured as a C corporation in order to receive the legal benefits associated with such a status (including limited liability for debts and business actions and access to capital markets), its taxes would be classified as corporate taxes. All other businesses, including sole proprietorships, partnerships, limited liability corporations, and S-corporations, report income on individual returns, and this amount is reflected in both pass-through income and business income, which comprises less than 15 percent of total individual income. [iii] Taxes on business income make up just 3.5% of total income subject to individual income taxes. Nationally, corporate taxes as a percent of the economy have declined over the last several decades. In the 1950’s corporate taxes as a percent of the national economy averaged nearly 5%. [iv] Over the last decade, that rate has dropped to 2%. 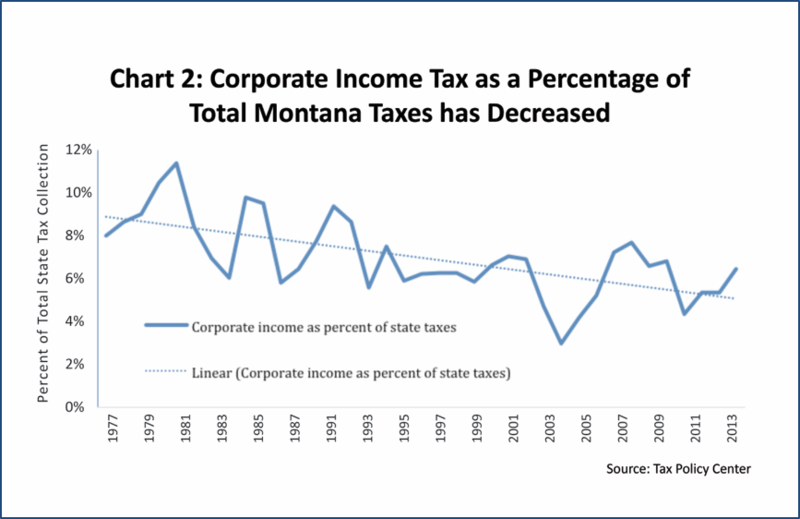 [v] Likewise in Montana, corporate taxes have been declining since the late 1970s, making up a smaller and smaller portion of total state taxes (Chart 2). [vi] In 1981, corporate income tax made up 11% of total Montana taxes, wheras in 2013 that number was down to six percent. 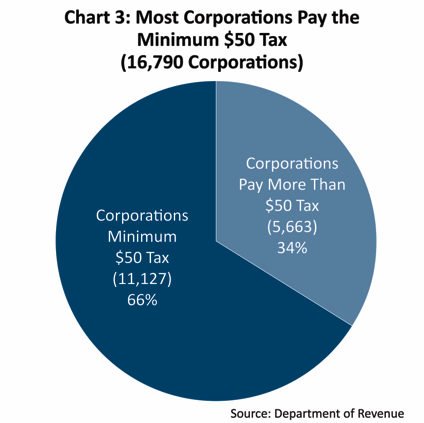 In 2012, Montana had over 16,000 C corporations, and only a third of them paid more than the $50 minimum corporate tax (Chart 3). According to Montana’s tax code, corporations pay either 6.75% of their net income earned in Montana or $50, whichever is greater. [vii] In 2012, over 11,000 (or 66 percent) of C corporations filed a return where the minimum tax was paid. As costs rise for providing the basic public services, infrastructure, and education that benefit corporations, the contributions of those corporations should rise too. Many large companies consist of a parent company and its subsidiaries. Combined reporting requires a parent company to add its income and its subsidiaries’ incomes for the purposes of state corporate income taxes. Montana then taxes its share of the total income based on the level of activity in Montana. States without combined reporting are vulnerable to a wide array of tax avoidance strategies by corporations. The tax avoidance strategies usually involve artificially shifting profits to subsidiaries that are in states without corporate income taxes or that do not tax a specific type of subsidiary. Combined reporting ensures that corporations pay their fair share of taxes in Montana based on their corporate activity in Montana. In addition, it improves fairness for smaller Montana-based companies. Local companies do not have subsidiaries across the country to which they can shift profits. Without combined reporting, large, multistate companies could engage in tax avoidance strategies that give them a competitive advantage over smaller, local businesses. Montana requires worldwide combined reporting, which means that corporations with common ownership must report all income worldwide, unless they make a “water’s edge election.” The water’s edge election allows multinational corporations to only report their income from the United States, rather than their worldwide income. In exchange, these companies agree to pay a 7% tax rate, rather than the normal rate of 6.75%. The NOL is particularly harmful during economic downturns. Individuals and corporations earn less during downturns and, in turn, tax revenue to the state decreases. Allowing businesses to receive a refund for previously paid taxes serves only to further compound Montana’s revenue problems during downturns. As a result, the state may struggle to fund essential public services like education, healthcare, prescription drug and child care assistance at a time when many Montanans need them the most. Eliminating the NOL carryback would bring in much-needed revenue, decrease the volatility of corporate tax revenues, and avoid unnecessary, self-inflicted fiscal damage for the state. If the NOL carryback were eliminated, businesses could still utilize the NOL carryforward. This provision allows businesses to carry their net operating losses forward and deduct them against future profits, providing tax relief for corporations during difficult times, but not at the expense of fiscal responsibility. Tax expenditures are often described as ‘‘silent spending.’’ They come in the form of preferences such as tax deductions, exemptions, deferrals, exclusions, credits, or lower tax rates given to individuals or businesses. Tax expenditures are considered a form of spending because they allocate funds for specific public purposes, but not through direct appropriations. These expenditures are commonly referred to as tax loopholes or incentives. They have a significant impact on state revenue as they reduce or eliminate revenue that would have otherwise been collected. Tax expenditures are not inherently good or bad policy. However, just like other state spending, they should be reviewed and evaluated on a regular basis to evaluate whether they are meeting the intended goals. The Department of Revenue creates a report of tax expenditures each biennium. However, there is no requirement that tax expenditures are reviewed regularly by the Legislature. Corporate tax expenditures cost Montana between $11 and 16 million per year. [xxiii] For more information about tax expenditures see Montana Budget and Policy Center’s 2011 report, Flying Under the Radar: Time to Evaluate Tax Expenditures. Montana currently allows a tax break for corporations, which does nothing to promote business in the state. Montana bases its tax code on the federal tax code, meaning that deductions allowed at a federal level are automatically given at a state level unless specifically disallowed by the state. The “domestic production deduction” is a tax expenditure the federal government passed for certain activities such as filmmaking, mining, and construction that occur anywhere in the United States. However, this means that corporations receive a deduction for these activities when paying Montana state taxes, even if the production actually occurred in another part of the country. This deduction, which has never been voted on by state lawmakers, reduced the income tax revenue to the general fund by $5.2 million in 2013. Non-residents of Montana claim the vast majority of the value of this deduction. [xxiv] For more information about the domestic production deduction, see Montana Budget and Policy Center’s 2011 report, Montana Can Bypass a Costly and Ineffective Federal Tax Break for Corporations. Decoupling from the federal domestic production. [iii] Montana Department of Revenue. "Biennial Report: July 1, 2012- June 30, 2014." December 2014. https://revenue.mt.gov/Portals/9/publications/biennial_reports/2012-2014/BiennialReport-2012-2014.pdf. [vii] Montana Department of Revenue. "Biennial Report: July 1, 2012- June 30, 2014." December 2014. https://revenue.mt.gov/Portals/9/publications/biennial_reports/2012-2014/BiennialReport-2012-2014.pdf. Because of privacy restrictions, data is not available on which corporations paid the minimum of $50. [xix] Montana Annotated Code 15-31-119.